Glamp it up in Bryn Helyg (Willow Yurt in Welsh) the biggest of our bentwood middle eastern inspired yurts, furnished with traditional rugs, cushions and blankets, copper-topped tables, wood-burning stove and proper beds, sleeping 4 singles or 2 adults and 2 children. It is at the top of the wildflower meadow overlooking the Giant Tipi, with fantastic views over the valley to the West with it’s own compost toilet accessed over a small bridge with a separate cooking area with small gas stove, cooking equipment, crockery and cutlery. 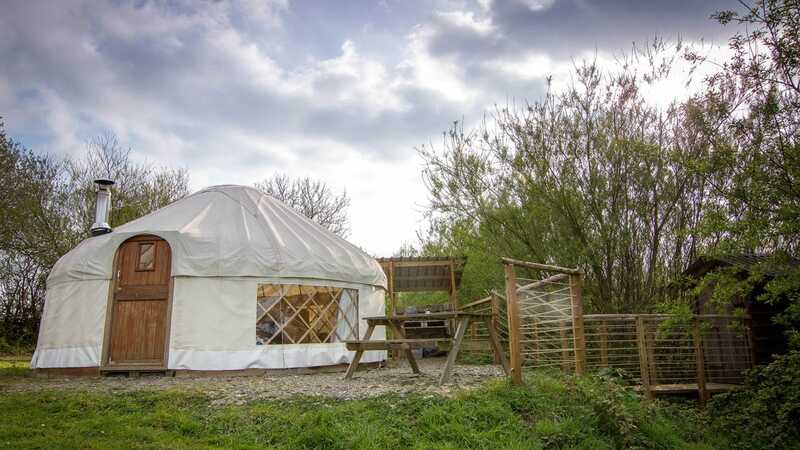 The yurt is on it’s own wooden deck with an outside seating area for al fresco dining with the BBQ beside, The closest showers, wash up area and additional toilets are in the shepherds hut by the Giant Tipi. Come to stay as a couple or small family, or take advantage of the privacy and extra accommodation it provides when hiring Ceridwen or the Byre. Two conventional loos and showers down in the farmyard (Old Dairy) and a new hand-built eco-loo shepherds’ hut with two female loos and a female shower, one male loo and male shower and a urinal are by the large tipi.